One year ago today I was at work, feeling horrible and constantly out of breath. I thought that I was just having a hard time recovering from a case of strep throat in late October. I must have been out of breath because I was out of shape. Not so. Christmas was particularly special this year just because I survived to celebrate it. According to the doctors, I would have been dead by now without my stem cell transplant. So, I am especially thankful to all of the people who came together and made this possible. It has not been an easy year, less so for the people that had to watch me recover from this disease, I think. I've made it this far and I don't plan on giving up anytime soon. My regular doctor's appointment was nice and uneventful. My numbers are excellent with a slight elevation in my platelets. Chris and I are still convinced that the winning cord belongs to a future stunt man. That kid is going to be a terror on the play ground. I'm waiting on the test results for my EBv count from last week. They should be back by now and I really hope that the elevation has been resolved. If not, then I'll have to contend with the thought of PTLD again. Rituxan's not that bad, but the thought of tumors growing all over me gives me the willies. The GvHD is under control at the moment and I'm tapering off of all the topical steroids. I have a follow up appointment at MDA on January 2, so we'll be on the road again. I'll post if anything happens between now and then. Let's hope you don't hear from me. Nancy, I'll trade you red blood cells for platelets and a small container of chocolate pudding. I have to apologize for not posting sooner, but I was in a snit when we got home from Houston last night. The news I got was mixed and I could see that Chris was really getting worried over it and to add to all of this, we spent ten hours collectively traveling. So we were tired and fretful. My blood numbers continue to be normal, or very close to. My magnesium levels are finally stable. My liver enzymes are another story. They were elevated last week--just slightly above the high range of normal. This week they were the same, more or less. 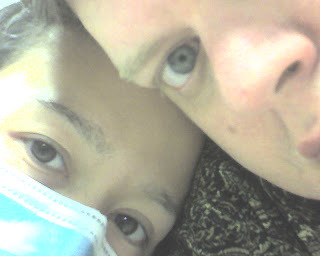 Chris was hoping that the massive doses of anti-viral medications that I was taking the previous week were the cause. Guess not. Dr. Kebriaei was cautious about what the numbers could mean and rightly so. It could be anything from medications to GvHD of the liver, or it could mean that the PTLD never fully resolved. The levels of Epstein-Barr virus in my blood were slightly elevated and this concerned my doctor. 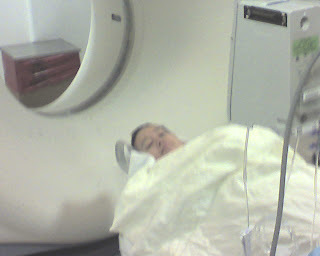 It's not a very good situation to be in since a wrong diagnosis could cause significant trauma. The treatment for GvHD of the liver includes systemic steroids which would suppress my immune system further. This would give the EBV in my system a chance to flare up in turn bringing back the PTLD. The treatment for PTLD would be more rituxan, but if I really had GvHD of the liver, it would mean that the condition would get an opportunity to get worse while I was being treated for the wrong thing. I'm damned if you don't and damned if you do. 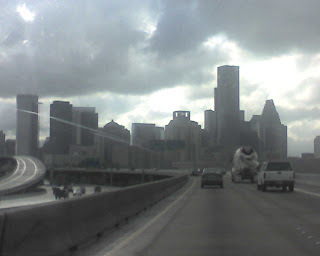 In two weeks, I'll return to Houston to be reassessed. I'm hoping that my numbers go back to normal and if not, I'm prepared to do whatever I need to. The results from my lumbar puncture were in and according to my doctor, I have nothing to really worry about. Chris was hanging from the ceiling. The pathologist who looked over the sample found rare abnormal cells that were non-malignant. I've been reassured that with the number and frequency of lumbar punctures that I'm having, that this was bound to happen. Repeat after me: "Non-malignant." The explanation was that they were mis-shapen cells of no particular type. Okay. As far as I know, the cancer is still gone and my doctor wasn't fretful about it. The dermatologist was very pleased with the way my skin has responded to the steroid cream she prescribed. The skin on my torso is almost normal and I hardly ever itch. I've been told to to reduce the number of applications over the next two weeks so that I don't thin my skin further. The skin on my fingers has gotten very thin and has split across every knuckle. It still beats being itchy and miserable. I've been advised that dry skin will be a way of life and that I must moisturize every day. I'm faithfully applying Eucerin and Cerave everyday, but I have to admit that I feel like a baby's bottom slimed with diaper cream. It doesn't help that the Eucerin cream is white and very emollient. Yum-yum. The Cerave is quite nice, though. The opthomalogist has confirmed that I do have GvHD of the eyes. After performing a test where small strips of paper are left to hang out of my eyes she informed me that my tear production is normal and that my eyes aren't "dry" at all. It turns out that they are inflamed from the GvHD and that's the reason for my discomfort. I have to apply steroid drops everyday for a month and I also have to apply cyclosporine drops twice a day. To cap things off, there's an anti-biotic ointment that I have to put in my eyes before bed time. Imagine it if you will, me trapped in my room, essentially blind thanks to the ointment and desperately trying not to rub up against anything because I'm slimy and sticky with moisturizers. It's really kind of funny when you get down to it. The cats take full advantage of my situation by taking turns rubbing against any exposed skin, leaving furry little tracks behind. It makes me crazy! All in all, it wasn't all bad news, and if I'm very honest with myself, none of the news we received was bad. All of the doctors consulted with one another and concluded that I wouldn't have to go on oral steroids for my GvHD. That's a plus, and my eyes already feel better after just a few treatments. We forgot to mention that we ran into a friend from leukemia last week. Mr. Clark of the tiny metal steer fame surprised us while we were at the stem cell clinic. We had the same leukemia doctor and would often entertain each other in the waiting room between appointments. We were surprised to find out that he was going to have a stem cell transplant and was in fact being admitted to the hospital that very same day. He's going to have the same procedure that I did with an expanded cord. Yesterday we got a chance to visit him in the hospital. For once I didn't mind putting on a floppy yellow gown and gloves. He's in isolation because his marrow has been burned from his body and he has no immune system. He looked amazing and reported that he only had a few side effects. The transplant is scheduled for tomorrow and we're praying that it goes as well as mine did. I warned him to ask for extra blankets since the stem cells will be fresh from the freezer and pumped in cold. I hope we'll be able to see him the next time we're in Houston and it just made me happy to see him doing so well. As a bonus, we got to visit with several of the nurses that cared for me during my many stays. I will always be grateful to the many people that cared for me and continue to do so while I recover from this. Just as I will be forever grateful for the many people that continue to encourage me and send they're prayers for good health. It means so much more than you will ever know. I never thought this day would get here and now that I'm living it, day +200 doesn't feel like a milestone. My baby stemcells are about to celebrate their 7 month birthday with a renovation of their new digs. They've been harassing my skin, causing me to look like a plucked chicken from the neck down. The dermatologist literally told me that I had chicken skin. I thought this was hilarious and very concise. She prescribed a one pound jar of steroid cream, advising me not to use it on my face, neck, or groin. Apparently, the steroid cream can cause a thinning of the skin, which would be bad in these delicate areas. I have noticed after using it for a few days that the skin on my fingers has become thin and I have suffered a few uncomfortable tears in the tissue. I'll have to be a bit more judicious when I'm applying it. The resident who was also attending me advised that I use Cerave cream on my face. It's on order and should arrive in the next few days. My eyes continue to be dry and sensitive. It's not horrible, but they constantly feel dry and uncomfortable. Kind of like facing a heavy wind for hours at a time with your eyes wide open. They look a little gray and bloodshot in addition to everything, convincing me that I have systemic GvHD. Luckily, my digestive system is plugging along, so maybe it won't be affected. I'm hoping that my liver enzymes go back to normal, because GvHD of the liver is seriously bad news. While I was in the hospital getting my transplant, two of my neighbors died from GvHD of the liver. Unfortunately, it's one of those organs that you can't live without. I should know on Tuesday. Houston, here we come. On a lighter note, I got to be the designated caregiver this week. Chris had his date with the dentist on Friday and since he was suffering the effects of valium and halcyon, I got to call the shots. Those of you who really know me are probably cringing right about now, since you know my sense of direction is pooh and the idea of me navigating the skinny roads of Denham Springs probably leaves you in a cold sweat. Ha! It worried me too. So, at the peak of morning traffic, we set off for the dentist in BR with fingers crossed. No problem. I managed to get him to his appointment on time without running anyone off the road and as a bonus, I didn't get lost. Poor Chris was scheduled to have a cleaning--his first in a very long time, 4 cavities filled and a root canal. He got a super surprise when he had to have an unexpected root canal bringing the total up to 2. I picked him up 4 hours later and he was definitely stoned. We sat in lunch time traffic for over an hour, seriously testing my charity towards the driving public at large. Road rage is my cross to bear. I'm working on it, I promise. That's all of the excitement for this week. I'm starting to get foggy from the intrathecal chemo, so things will probably be quiet blog-wise until Tuesday. 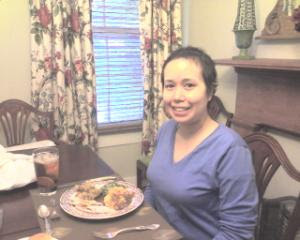 This week was Ann's December follow up at MDA. So the day before yesterday we packed up the Saturn and headed out to Houston. As per normal I drove the first leg of trip and Ann was going to drive the return leg. After having done this about 8 times now the trip has almost become routine, and we thought it would be fun to share some of the more unique sites we have been seeing. This isn't a usual site but it was just too good to pass up. As we closed in on this guy somewhere near Lafayette Louisiana, what was painted on his trailer made both of us do a spit-take and dive for our cell phones and struggle to turn on the cameras. It's not so clear in this shot...need to get a little closer maybe. Yes! 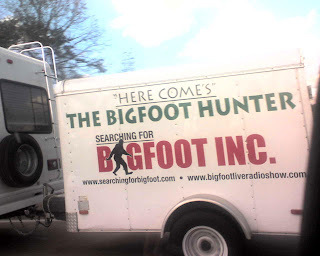 It's "The Bigfoot Hunter" himself! No doubt on his way to a "made for the Sci-Fi Channel movie" or a special for TLC or NGC. Practically every car on the road qued up beside this guy to point and laugh. 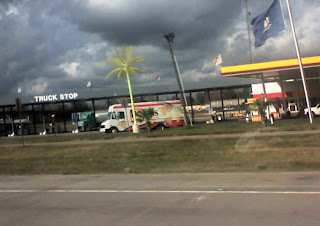 Next up in Beaumont Texas is a strange collection of metal palm trees that flash with strange, almost hypnotic neon lights. You would think from looking at them that they had been imported from Las Vegas, but you'd be wrong. There is a business in Beaumont that actually specializes in the manufacturing of these things. 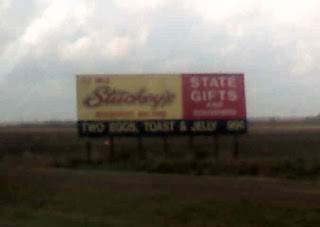 Blast from the past outside of Beaumont- Yes it's a Stuckey's! These things used to be everywhere, and I do mean everywhere, before the advent of the superdelux truckstops of today that have hotels, garages, shopping centers, video stores and restaurants built on to them and look more like space ports than diners. Stuckey's holds a special place in my memory, because it was there on a family trip when I was about eight, at this corny little slice of southern Americana, that I first became aware of velvet Elvis paintings! 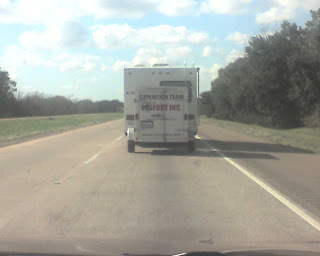 Last but not least We spotted this right outside of Winnie Texas and is priceless. If you find yourself completely lost while driving and happen across a sign like this, it's a safe bet that you can narrow your geographic location to the deep south. 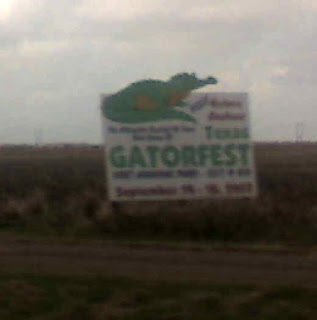 I've got no idea what "Gatorfest" is but your imagination is probably just as good as mine. Suddenly before you know it the southern rural landscape that I-10 cuts through, turns into a spaghetti bowl of concert ribbons that leads to Houston. It's like discovering civilization again. Trip totals: 4 hours (give or take) and 289 miles. 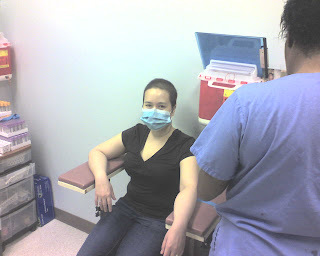 At MDA Ann had her follow up with her transplant doctor and subject number one was her dry and itchy skin. Doctor Kebreai had begun to strongly suspect chronic systemic GvHD, based on the dry skin, bumps, occasional dry eyes, reduced white blood cells count and slightly elevated liver enzymes. Normally she would have treated Ann with oral steroids but because her symptoms were so minimal, she didn't want to jump to conclusions. So she set up a appointment with the dermatology and melanoma center. There we meet Doctor Hymes who is MDA's expert on skin GvHD. She gave Ann the once over and made her diagnosis pretty quickly. Based on the dry skin, hive like bumps, little blisters, and alopecia she though it was a pretty clear but "unimpressive" case of chronic GvHD. Both Doctor Hymes and Kebreai conferred and agreed that they were not going to start with oral steroids until we return to MDA next week to see ophthalmology and give the liver enzymes a chance to return to normal. The liver enzymes could be due to an increased amount of Valtrex that Ann was taking through last week and over a week the medicine should have a chance to work it's way out. If not then it could be chronic GvHD of the liver as well. So Ann's treatment, for the moment, is steroid creams and gels. They also halted the Prograf taper and have restarted her Anti-fungals. That suites us fine because oral steroids would mean immune suppression which could mean a chance for the PTLD to return. Once was scary enough thank you very much! Overall I think this is good news though. Transplant patients with chronic GvHD are statistically less likely to relapse and unlike Acute GvHD, chronic GvHD is usually a very treatable condition for most who have it. I'm also hopeful because the transplant team has remarked on how mild Ann's symptoms are, which implies that treatment could be mild as well. I just hope the little baby stem cells know how precious and wonderful their new home is and take it easy while they are rearranging the furniture. Since returning to Baton Rouge, Ann has started using the steroid cream and is very happy to report that her skin feels "so much better". I don't know why I feel compelled to write today as nothing has really happened today. Chris spent the entire day working on a consulting job that he picked up while he still looks for a full-time job. I've asked him to teach me how to do what he's doing while we both still have free time. It finally feels like I can wrap my head around something without getting too distracted by the details. I keep toying with the thought of starting a correspondence course just to keep on track with my degree. 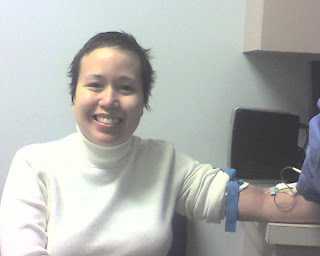 I've been reluctant because of the ever present chemo brain and I'm not sure how I'd be able to take the tests. The one other time I took a correspondence class, I had to go to a place on campus to take a midterm and a final. Maybe I'm just being a giant chicken. There are two less pills in my pill case these days. I stopped taking V-fend on Tuesday and haven't spontaneously started growing mushrooms. This is one step closer to being normal. Prograf is next. I've been speculating on my future without pills. Essentially, this should mean that my immune system is mature enough to handle day to day living. 32 years passed without me having to think about whether my marrow could produce normal, functioning cells. I'm afraid that I'll spend the rest of my life worried that I might make a misfit. If I do, will I be able to "fix" it? This is something that faces everyone in my situation. I'll just keep taking it one day at a time, I suppose. And there you have it, I'm normal. My red blood cells are still just below normal, but my hemoglobin is great. No complaints here. Dr. Bienvenu immediately honed in on my little skin problem today. The good news is that he doesn't believe that I have shingles. He assured me that my blisters and rash don't look "right" for the diagnosis. He was also kind enough to prescribe something for the itching. Last night I thought that I was going to peel my own skin off. Patches of small blisters appeared on the backs of both hands and they were relentlessly itchy, even after applying cortizone cream. Before I went to bed I took a pill for nausea that contained benadryl. I just wanted some relief from all of the itching. There's not much else to report. I'll continue to take the massive doses of anti-virals until I see my doctors next week. I'm looking forward to seeing the dermatologist. Pray for a concrete diagnosis. I'm convinced that I have a mild case of GVHD of the skin, but I have to convince the doctors of this. When will all of the excitement in my life end? Let me preface this post by admitting that I did break my own rule and let some pictures posted on the net scare the poop out of me. I've had a small, dry cough off and on for the last few months and it's been driving Chris crazy. Every doctor that has seen me for it has come to the same conclusion: post nasal drip. Even I can feel it. With the weather being what it is down here, my allergies and sinus complaints flare up constantly. It was almost 80 degrees the other day, which aggravated my allergies and caused my cough to reappear. It went away after a day and I didn't think anymore about it. Two days later, it was 40 degrees which started the cycle all over again. My nose is runny and my cough is back. I'm fairly certain it will be gone in a day or two. If I could remember to do my Flonase regularly, it would be gone sooner. Of course, a cough for a transplant patient could be a portent of something more sinister. Chris is on the look out for popcorn lung, which I can sincerely hope never to be diagnosed with. Now you have to consider my skin flare ups and combine that with the fact that I'm recovering from PTLD. Chris has done exhaustive research on this condition and occasionally, I'll look at an article or a photograph. The other night I read a few articles on lymphoma and PTLD and of course there were pictures attached. It's not the prettiest thing I've ever seen. Last night my neck began to itch and when I reached up to scratch it, I found a small blister. Guess what some of the pictures related to lymphoma and PTLD of the skin looked like? Chris was ready to take me into the emergency room at MDA. He almost had my transplant doctor paged at home. He was talked out of it on the provision that I email my doctor describing my newest dilemma. I found a few more blisters on my collar bone, but the rest of me was all clear. My PA called me first thing this morning. She was very thorough in asking about my symptoms and wanted detailed descriptions of the blisters. Of course I mentioned lymphoma in my email. I had broken a cardinal rule and self diagnosed. We've all done it at one time or another. I've been told that first year medical students are particularly prone to it. I can't remember any of my doctor friends doing it, though. Dr. Kebriaei called a few hours later and spoke with Chris. He asked if it could be lymphoma or PTLD of the skin. She reassured him that it wasn't. If I'd honestly stopped and really thought about it, I would have known that it couldn't be either. My blood numbers are excellent and I generally feel really well. Every time that I've been diagnosed with something, I've had extreme symptoms and felt unwell on some level. I was tired and cranky yesterday and I think this is part of the reason I let myself panic. I really have to give my transplant team a lot of credit. They've been very good to us and they're vigilant about being sure that Chris and I are okay as a unit. Without being able to see me to give a diagnosis, my doctor thinks it may be shingles. I did have chicken pox as a child and I do still carry the virus. Add to this that I've been immunosuppressed for almost a year and I wonder that I haven't come down with it sooner. I have to take 2 Valtrex pills 3 times a day until I see her next week. I've done a little reading on the subject, glutton for punishment that I am, and the blister looked similar--not exactly like shingles. We're not really sure that this is what it is, but my doctor isn't taking any chances. Chris has never had chicken pox and is now in danger of me. He's not to touch the blisters or rash since he can contract chicken pox from contact with them. Even if it's not shingles, I don't want him to take any chances. I'll see my local oncologist tomorrow. Now I'm worried about infecting unsuspecting people. This is quite a switch for me. Dixie is in the clear since she's been previously exposed to chicken pox, but I can't vouch for other people that I will come into contact with. It's very frustrating to think that I could pass something along. I'm reassured that it's not airborne and that you actually have to touch me at an infected point to catch anything. So, please forgive me if you want a hug and I run the other way. I'm thinking about taking bets on what strange and new complication waits on the horizon. On second thought, I really shouldn't joke about things like that. As far as I'm concerned, life is still good and I don't have much to complain about. I'm taking a break from baking with self preservation in mind. My little gut is hanging out a little farther than I'd like. My own fault for gorging on cookies and all things full of sugar. What was that promise I made to eat well with nutrition in mind? I'll ask Dr. Bienvenu about my skin tomorrow. Of course I'll post what he says. I couldn't sleep, so I've been trying to keep myself entertained without waking everyone else up. Unfortunately, the cats heard me moving around and since they know I can open cans, they've been following me around making a bit of noise. It's nice to be loved for your innate skills. My dry skin continues to be a problem for me. I can't remember if I mentioned it before or not, but I'm covered in tiny red bumps from the neck down. It seems to be getting worse in some areas and holding steady in others. I've been saturating myself with Aquaphor to keep my skin from cracking and flaking. It has managed to keep me in check, but I'm still hoping for some relief. Chris has been researching the problem and last night, he thought that he'd found a potential diagnosis. Please keep in mind that I've never in my life had a problem with my skin that required special attention. This excludes puberty, and vanity--we've all lived through it. 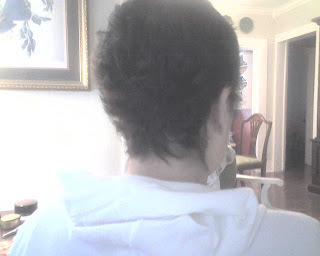 Chris found several articles related to PTLD and transplants that mentioned eczema. Most of them pointed to immunosupressive drugs and possible GVHD being an underlying cause. I'm not sure that the tapering of my Prograf started this, because the whole dry skin issue cropped up during my last stint in the hospital. My doctor still doesn't think it's GVHD because I'm not presenting with the usual symptoms. A few articles mentioned family history. I told Chris that there was no way that it could be family history. My mother's side of the family has the most beautiful skin you've ever seen and to date I can't remember any of them suffering from any skin related ailments. My dad had a tendency to get sunburned, but no eczema. Chris made a very valid point after I stepped down from my soap box. I actually don't know a thing about my family history. Since my transplant engrafted, I've been operating with a whole new system. Somewhere out there could be an extended family only related by transplanted blood. Spooky when you think about it. The woman who donated the umbilical cord blood could suffer from any number of things, including eczema. There are a host of realizations that I've been dealing with since my transplant. I understand the mechanics of what happened and why, but the science of it occasionally flusters me. I know that I'm in very good hands, so I don't let the small stuff bother me. These are the ramblings of someone who didn't get enough sleep. I'll try to make more sense later, when my brain catches up to the rest of me. Here I sit, all by myself, none the worse for wear. I managed to survive the raw meat weekend with no discernible damage. Dixie is at work and Chris is out getting the truck's windshield repaired. We were savaged by a large rock on the interstate yesterday and it left a big enough spider web crack that he thought it best to have repaired immediately. We had another incident with a rock in Houston that left a small chip in the windshield that we kept forgetting to get fixed. Strangely enough, they always land on the passenger side of the car while I'm riding in it. I believe I'm working with good karma, but bad mojo, so Chris will be buying all future raffle/lottery tickets. Dixie's poor cat is stuck inside with me. She's a great big fluffy girl who likes to roll around in the leaves outside and watch birds. Unfortunately, the next door neighbor caught her sitting on the hood of his truck and had a very loud melt down the other day. I won't repeat what I heard him say (I was actually inside the house and it was like he was screaming next to me) but PETA would be sitting in his front yard with cans of red paint if they'd heard it. So, the Gregory household has yet another shut in. Poor Pez. I'm still on the baking kick and Dixie is only feeding my habit. She came back from the store with 4 bars of dark gourmet chocolate yesterday. We both saw a recipe for chocolate dipped shortbread cookies in a magazine and I'm thinking that it's next in the line up. At the rate I'm going, I'll be back to my pre-cancer weight in no time. I actually think I'll exceed it at the rate I'm going. I've had just about all of the "normal" excitement that I can stand after this weekend. Granted, non-medical drama is preferable to being hooked up to IV poles and having to ask for showers while trapped in a hospital. Speaking of hospitals, it's undergoing renovations right now to add a few more floors. This is great news, since they were always short on beds. On the other hand, I'm glad I'm not currently a patient. It's probably pretty noisy, and there's only so much construction dust that the hepa filters can get out of the air. I'm off to feed myself and then I'll probably start baking. Before I forget: HAPPY BIRTHDAY LAREN! TRY NOT TO TALK TO STRANGERS ON THE SUBWAY :). OK so we got the call back from Ann's transplant Doctor back in Houston. Long story short she said "don't panic". She reassured me that the under-cooked beef will probably not cause a problem, and we didn't have to start Ann on antibiotics or rush her to the hospital for a stomach pump. I was prepared for either of those if need be. 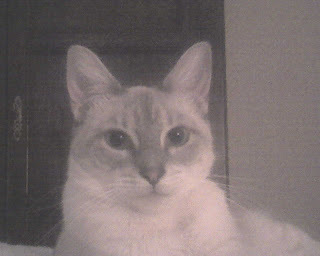 She also told me that because Ann s on a prograf taper her immune system is not fully suppressed. So she's not totally defenseless to any bugs she might run into, but just keep an eye on her just to be sure. Ann is scheduled (unless something else happens) to stop taking her Prograf when we go back to MDA the middle of this month for her check up. OK so now I will try to relax and see if I can pry my fingers out of the ceiling without leaving claw marks. I may have tempted fate with my posting yesterday, after all. We have a bit of a situation developing here tonight. We got take out from a restaurant that I've never eaten at before. Dixie frequently lunches there during the week, and we thought it would be a nice change from our usual haunts. Half way through my meal, I found a piece of very undercooked beef, which wouldn't have bothered me were I a normal person. Chris called MDA and had my transplant doctor paged and we're just waiting for her to call back. I don't think that there's any particular protocol that gets followed in this case. It may just be a wait and see situation. In fact, I'm pretty sure it will be. No magic pill for undercooked beef. I'm just going to sit in an out of the way spot until the panic dies down. I'll let you know what happens.